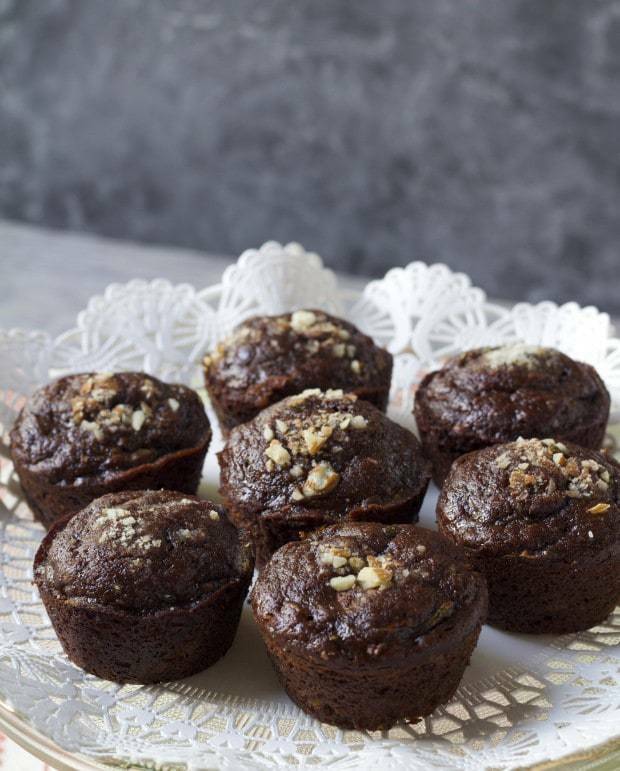 You could almost proclaim these chocolate zucchini muffins cupcakes, they are so full of honey and chocolate. Except they don’t have the creamy swirl on top. Without frosting—it’s a muffin; with frosting it’s a cupcake, do you agree? There is no need to frost these babies anyway—they hold their own in the chocolate department, with both cocoa powder and chocolate chips. The zucchini—you can hardly tell it’s there, yet it’s the zucchini that keeps them moist. Naturally sweetened with honey and nutritiously bumped with whole wheat flour. This recipe is adapted from the chocolate zucchini bread in my Chocolate Snowball cookbook. I made these muffins healthier and even more delicious than their parent. Here’s how. The white sugar and flour are gone, replaced with honey and whole wheat pastry flour. There’s new crunch, with chopped almonds instead of sliced. And I reduced the dry ingredients just a fraction, making them more tender—more heavenly. 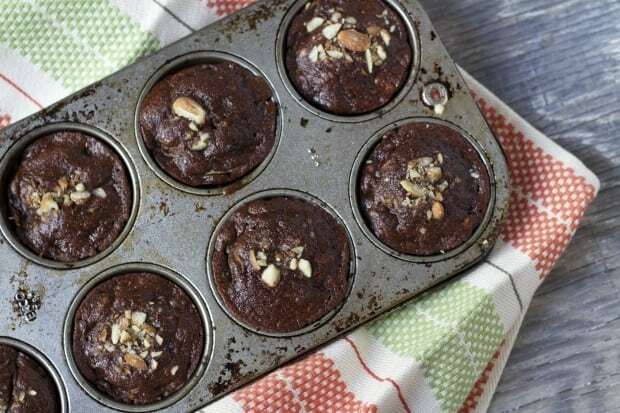 I won’t call them cupcakes, because they don’t have frosting, but you can definitely serve these chocolate muffins for dessert. They’re also great in lunch boxes and for after-school snacks. 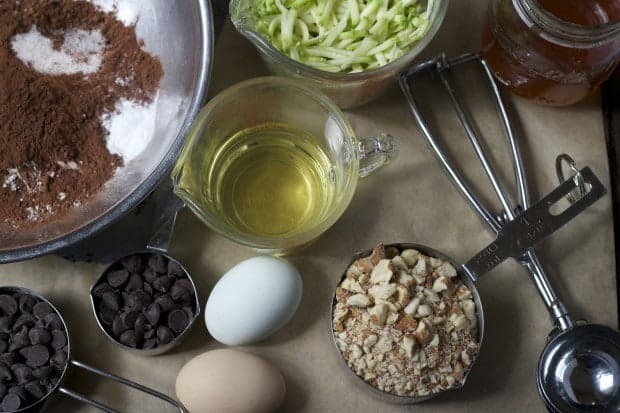 The next time you have a leisurely brunch—end with these chocolate zucchini muffins. To release muffin batter into the tins, I use a multi-purpose ice cream scoop with a rotating metal bar. These are super handy tools that drop uniform clean portions of both muffin and cookie dough. They come in different sizes–look for the number, which tells approximately how many scoops to a quart, engraved on the metal bar that moves inside the scoop. My go-to muffin scoop is a (#16), which holds a little less than 1/3 cup, like this, or this. Got beets? Try these Chocolate Beet Cookies. If you make this recipe, please consider leaving a blog post comment. Your comments help other readers learn more about the recipe. These chocolate zucchini muffins are practically dessert. They are great for school lunch boxes or afternoon snacks. Preheat the oven to 350°F. Spray 16 muffin cups generously with cooking spray, or line with paper cupcake liners, or coat the tins with melted butter and dust lightly with flour. With an electric mixer, beat the cream cheese and honey until homogenized, scraping the sides and bottom of the bowl as needed. Add the eggs one at a time. Scrape the bowl again as needed. Mix in the oil and vanilla extract. Sift the flour, cocoa powder, cinnamon, baking powder, baking soda and salt. Add to the cream cheese mixture, blending well. Mix in the zucchini, 3/4 cup of the chopped almonds and the chocolate morsels. Divide batter among the prepared muffin cups, about 1/3 cup batter per tin. Sprinkle with the remaining almonds. 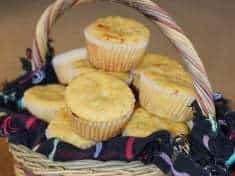 Bake 18 to 20 minutes, until the tops of the muffins spring back when touched with a finger or a toothpick inserted in the center comes out clean. Cool about 10 minutes, then remove from the tins. To release muffin batter into the tins, I use a multi-purpose ice cream scoop with a rotating metal bar. These are super handy tools that drop uniform clean portions of both muffin and cookie dough. They come in different sizes--look for the number, which tells approximately how many scoops to a quart, engraved on the metal bar that moves inside the scoop. My go-to muffin scoop is a (#16), which holds a little less than 1/3 cup. Thanks for your comments and questions. 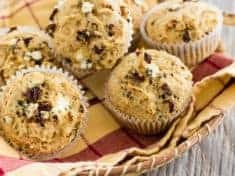 For zucchini muffins without chocolate, why don’t you try substituting zucchini for both the grated carrots and apples in the Sunshine Muffins from Chocolate Snowball. Use a different nut or keep the sunflower seeds and be sure to make the high altitude adjustments of reducing the sugar and baking soda. Can your yellow cake have almond paste in it? Try the cake I use for Stein’s Favorite Marzipan cke in Chocolate Snowball. If you don’t want that almond flavor–start with a chiffon cake and make altitude adjustments. Re: Red Velvet cake for high altitudes: We took a standard velvet recipe and “altituded” it. I like a bit more cocoa, so we doubled that in the recipe. I also know it is unnecessary to have all that food coloring and we cut that amount in half–cake still bleeds red. We also reduced the leavenings and sugar and we are pleased with the recipe we use at Deer Valley. Doing the Rhine and Alsace region after the Wedding of Erika. Any chocolate must see in Eastern France. Thanks Sam! I would go for the raw agave. Though I have been using the coconut sugar as well and it works great. Just haven’t tried it w these muffins.